Use the power of questions to lift Leadership dialogues to another level. Transform your next workshop or learning event and get the creative juices flowing with our legendary Insights Cards on Leadership. 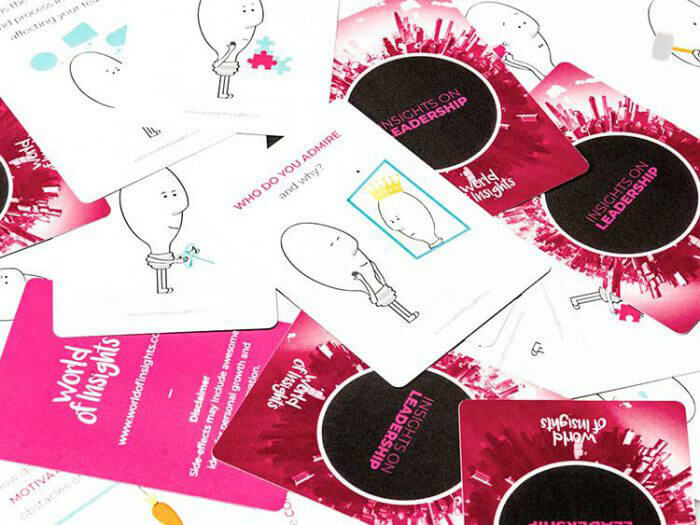 Our Insight Cards are used by team leaders and facilitators all over the world. They are an easy and inspirational way to start a learning event or deepen dialogue in small groups. The game is based on powerful questions and draws on a number of latest management theories as well as neuroscience, making most of the group learning process. The game deck includes 40 powerful question cards on product-, service- and business innovation and 12 “what if” questions to spark out of the box thinking. Players: Up to 15 with one deck. The cards are easy to carry and suit multiple settings and group sizes. 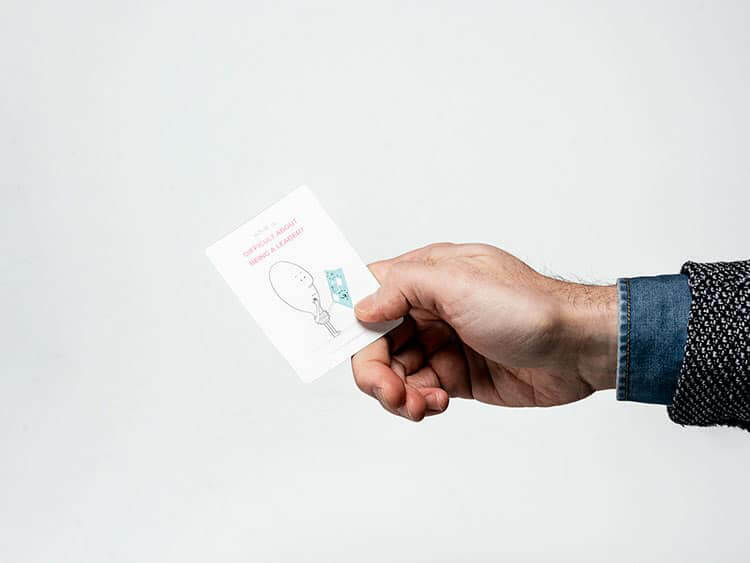 The Insight Cards are simple to adopt in minutes and require no facilitation skills. The game builds individual and collective capacity to discover innovation insights through powerful questions. To expediate delivery, please make sure all your shipping and payment information is correct and that you have included a phone number in international format (for courier purposes). All prices quoted throughout this site are VAT included. The Value Added Tax, or VAT, in the European Union is a general, broadly based consumption tax assessed on the value added to goods and services. It applies more or less to all goods and services that are bought and sold for use or consumption in the European Union. All consumer customers inside the European Union are liable to pay the VAT. Business customers in Finland have to pay the VAT, but they can deduct the paid tax in their regular company tax declaration. Business customers registered for VAT in the EU (except Finland) can deduct VAT from all prices using the valid VAT number of your company at the checkout on our webshop. The final VAT Free value will show in Your Shopping Cart before you confirm the payment. Shipping costs depend on gross weight of goods and country destination. to tell us why it failed to meet your expectation and we'll organise the return and refund. 4. 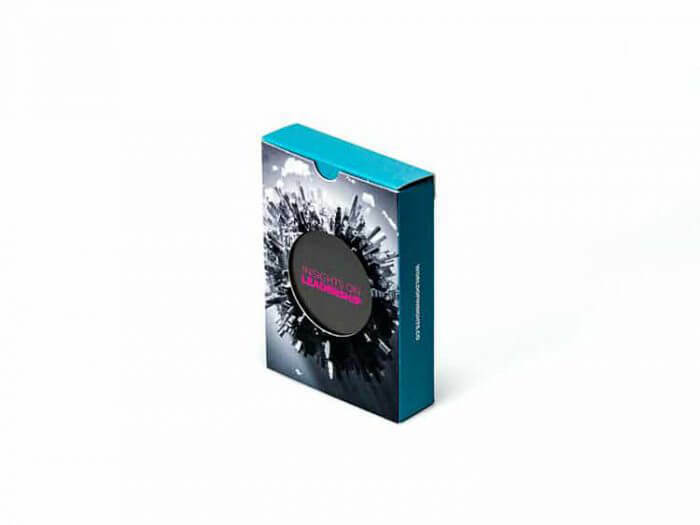 The product has been repackaged into its original package or an equivalent.